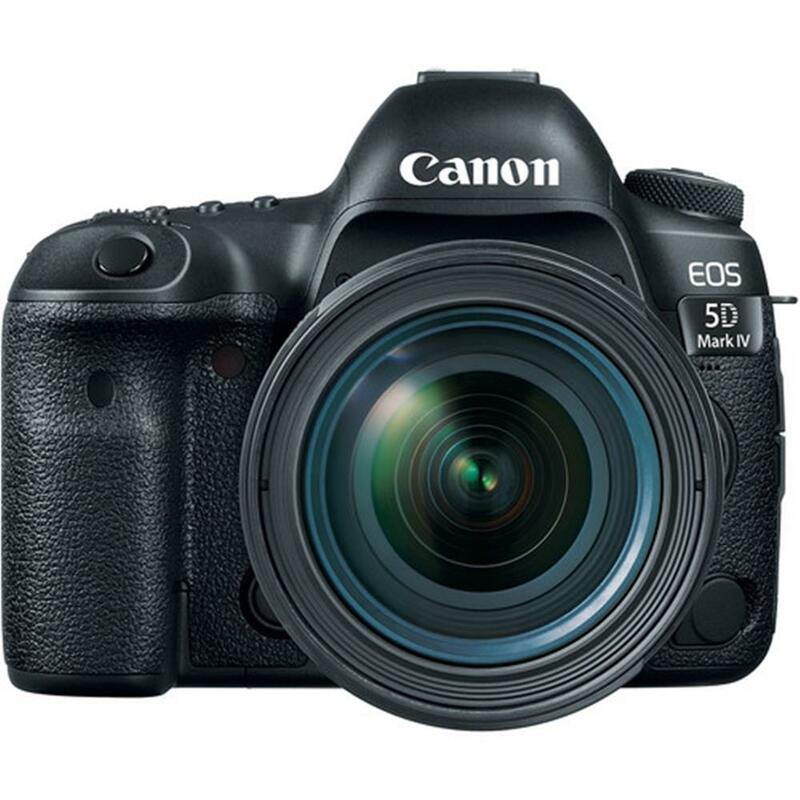 Purchase a select Canon EOS 5D Mark IV DSLR Camera or a select Canon EOS 6D Mark II DSLR Camera. A Canon Premium Series LP-E6N Battery and Bag Accessory Kit will automatically be added to your Shopping Cart. A $249.99 value. Offer valid April 19 to May 2, 2019, until 11:59 p.m. E.S.T., or while quantities last. Superb image quality is achieved with Canon's 30.4 Megapixel full-frame sensor, and highly-detailed 4K video is captured with ease. Focus accuracy has been improved with a refined 61-point AF system and Canon's revolutionary Dual Pixel CMOS AF for quick, smooth AF for both video and Live View shooting. Fast operation is enhanced with Canon's DIGIC 6+ Image Processor, which provides continuous shooting at up to 7.0 fps*. 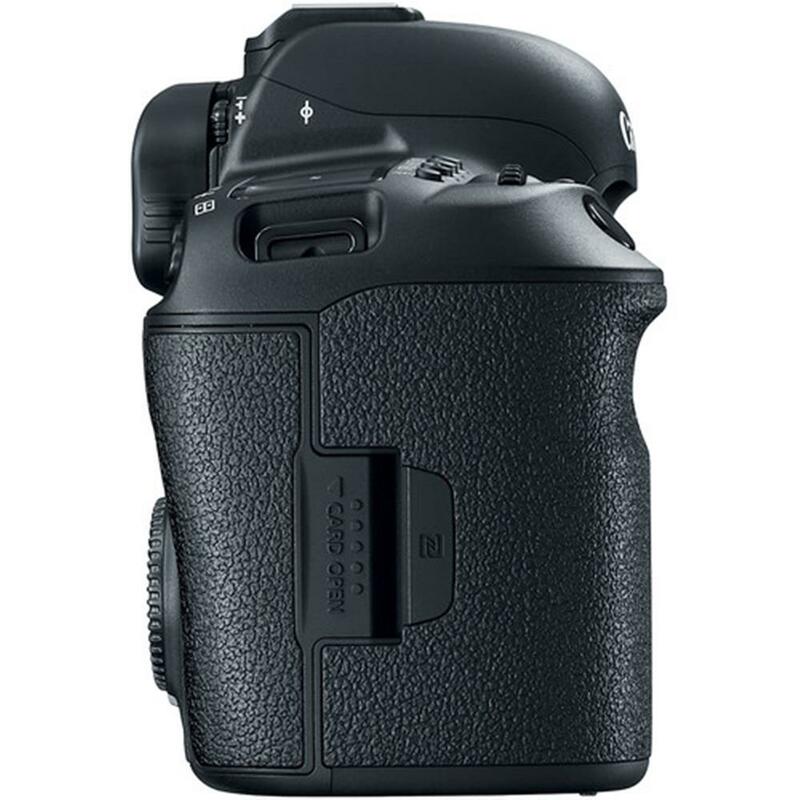 Built-in Wi-Fi**, GPS*** and an easy-to-navigate touch-panel LCD allow the camera to become an extension of you. When quality matters, the EOS 5D Mark IV helps deliver results to inspire even the most discerning imagemaker. The EOS 5D Mark IV camera boasts a full-frame, high-speed CMOS sensor that's ideal for a broad range of applications with its remarkable high-resolution abilities. Measuring approximately 36.0mm x 24.0mm, the same size and ratio as a 35mm film frame, it records 30.4 effective Megapixels at normal ISOs of up to 32000. It also captures incredible still and 4K video clips suitable for significant post-processing, retouching and cropping. Versatile in virtually all kinds of light and any shooting situation from print and wedding to full-bleed magazine spreads and other commercial or fine art use, the EOS 5D Mark IV consistently produces high-resolution 4K video and image files that are easily compatible with any number of diverse workflows. * Saving a still image from a single movie frame may not result in the same image quality as a normal still image. Adding to its powerful and portable design, the EOS 5D Mark IV camera utilizes Canon's smooth, fast and intelligent Dual Pixel CMOS AF. Featuring two photodiodes per pixel and each pixel capable of phase-difference detection autofocus, the CMOS sensor can deliver fast and accurate AF throughout approximately 80% of the image plane. Able to detect shifts in movement at the pixel level, Dual Pixel CMOS AF enables continuous automatic AF and AF tracking that enhances overall camera operation for sharp still images and smooth, accurate focus transitions in movies. Working with the EOS 5D Mark IV's 3.2" touch panel LCD screen, Dual Pixel CMOS AF lets photographers select focus points throughout the frame with the touch of a finger, and confirm focus by zooming in on the image or enlarging stills grabbed from video recordings. The EOS 5D Mark IV camera features a 1.62 million dot, low-reflection 3.2-inch Clear View LCD II monitor for bright, sharp display in a wide variety of shooting situations. The LCD's touch panel surface facilitates fast, intuitive operation, including AF frame switching, menu and setting changes plus image magnification during Live View shooting and movie shooting. Still photographs can also be captured quickly with the touch panel's shutter release function. A customizable Quick Control screen adds flexibility and convenience for specific users' preferences. 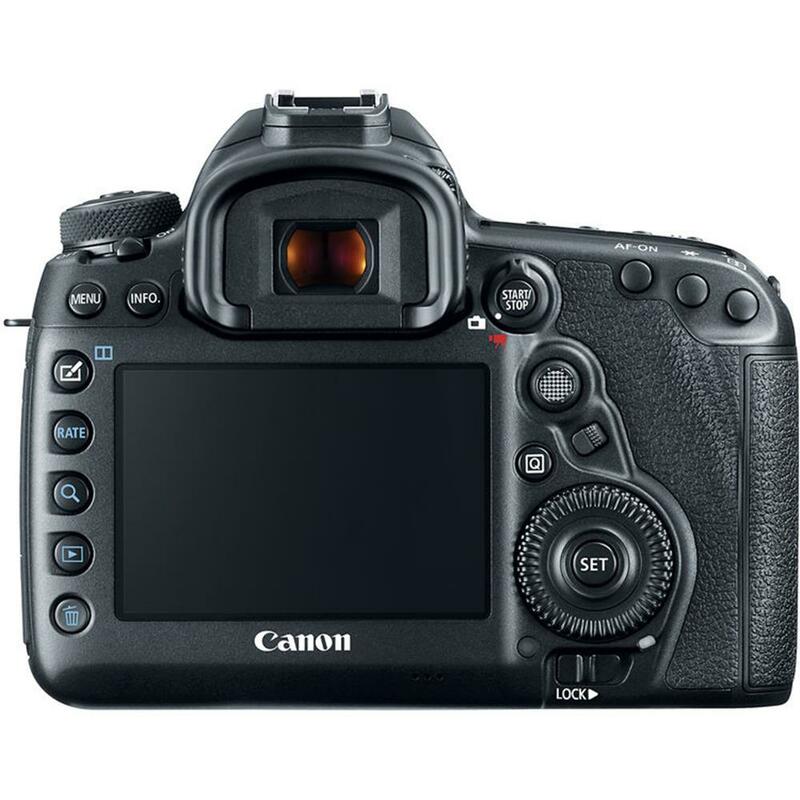 Image review and playback are also enhanced with the EOS 5D Mark IV camera's Clear View LCD II Monitor. Not only does the EOS 5D Mark IV's LCD provide a high-precision image for composition and playback, but it also remains visible even when the photographer is wearing polarized sunglasses! In numerous situations in the studio and in the field, the EOS 5D Mark IV's LCD panel is an ideal complement to its amazing TTL viewfinder. The EOS 5D Mark IV camera is designed to keep up with the action. Its remarkable shutter, advanced AF and exposure and image processing systems help ensure virtually instantaneous response and performance at up to 7.0 fps**, even at full resolution. Whether searching for a joyous expression on a bride's face or capturing an athlete in action, the EOS 5D Mark IV doesn't let file size compromise the speed of capture even when bracketing exposures of a complex lighting situation, helping photographers and moviemakers attain consistently high performance in many situations. The powerful DIGIC 6+ Image Processor increases the EOS 5D Mark IV camera's in-camera capabilities, enabling fast operation across the board and helping to ensure that high-quality still image and 4K video recording is achieved no matter the shooting environment. It has a noise-processing algorithm that helps reduce noise at high ISO settings, and features a Digital Lens Optimizer that can automatically apply a variety of aberration and diffraction corrections as well as other corrective measures specific to the lens in use. The EOS 5D Mark IV's power to perform numerous operations with ease is made possible in large part thanks to the amazing DIGIC 6+ Image Processor. 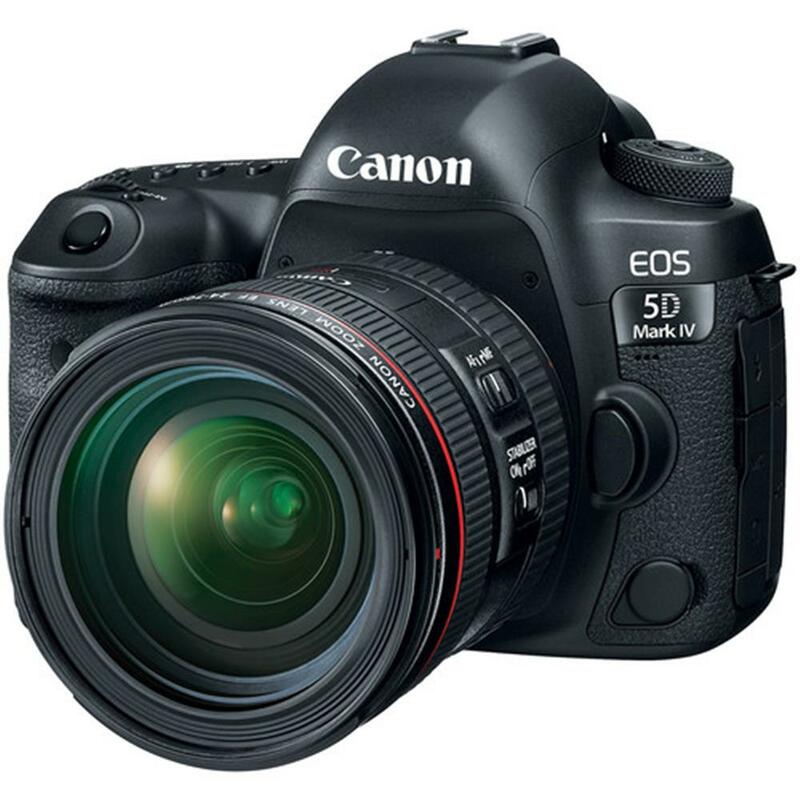 To complement its stellar CMOS sensor and powerful processing abilities, the EOS 5D Mark IV camera incorporates a 61-point High Density Reticular AF II system. It features up to 41 cross-type points and an extensive AF area that extends well into the top and bottom of the peripheral frame. It also has a wide subject tracking area that enhances the AF system with consistent focus tracking to capture the action at hand and includes Canon's AI Servo AF III, which remembers the AF path and helps refine precision shot-to-shot. Low-light performance is phenomenal - the AF system's low-intensity limit is EV -3 at the center AF point and all 61 AF points are compatible down to f/8 for excellent low-light performance, even with lens extenders attached. To help ensure that AF points and other shooting information are visible at a glance, the EOS 5D Mark IV also features Canon's Intelligent Viewfinder II for a bright, customizable view. Whether choosing individual AF points manually or using one of the camera's automatic AF selection modes, the EOS 5D Mark IV's AF system is a significant part of its overall excellence. To help deliver nearly fool-proof performance, the EOS 5D Mark IV camera employs a powerful and instant subject and light analysis system. The iSA Intelligent Scene Analysis system uses its own RGB+IR light sensor with an approximately 150,000-pixel resolution to provide the camera with immense image analysis in an instant, making necessary corrections along the way. The sensor enables Canon's anti-flicker function, which detects the frequency and phase of a light source's flicker (such as a fluorescent light) and captures images near the point of peak brightness when the subject is most likely to be well-illuminated. The EOS 5D Mark IV also incorporates Canon's Intelligent Tracking and Recognition system (iTR AF) that detects and tracks subjects, automatically switching the AF point to optimize tracking. Using tracking algorithms tailored to recognize faces and colours, this system not only helps to quickly and automatically select the ideal capture settings, but also serves as a brilliant foundation to the EOS 5D Mark IV's AF system. The EOS 5D Mark IV camera is equipped with a number of advanced features designed to combat image degradation from lens aberration, focus and other characteristics that can adversely affect the quality of the final image. The EOS 5D Mark IV's Dual Pixel CMOS AF system enables capture of Dual Pixel Raw (DPRAW) files***. Images shot as DPRAWs have additional adjustment possibilities when processed with Canon's Digital Photo Professional image processing software, which enables pixel-level adjustment and refinement for still photographs and includes Image Micro-adjustment to help maximize sharpness in detail areas, Bokeh Shift for more pleasing soft focus areas and Ghosting Reduction to help reduce aberrations and flare. The EOS 5D Mark IV camera is also equipped with a number of in-camera optical correction functions previously available only using Digital Photo Professional. It comes preloaded with aberration data particular to specific lenses, helping to eliminate the need to register lens data on previously released lenses and correcting images with virtually no delay in-camera. The EOS 5D Mark IV not only fixes peripheral brightness and chromatic aberration, but also features distortion correction and diffraction correction. Distortion correction helps resolve barrel and pincushion distortions, while diffraction correction helps to eliminate the blurring effects from diffraction that can be created when capturing an image at a small aperture. The EOS 5D Mark IV's in-camera Digital Lens Optimizer works with the camera's DIGIC 6+ Image Processor to help ensure these corrections can be made with virtually no effect on operational speed, even when shooting numerous successions of JPEG images, speeding up the photographer's workflow and delivering gorgeous images right from the camera. For a useful and quick workflow in a variety of locations, the EOS 5D Mark IV camera's built-in Wi-Fi feature can help streamline camera operations across the board. easy without ever having to take the camera out of its bag. Full DLNA (Digital Living Network Alliance) compatibility means easy sharing between the EOS 5D Mark IV and other DLNA products, such as HDTVs and compatible smartphones. Still images can even be transferred between two wireless-enabled Canon cameras over a Local Area Network (LAN). Images and video can also be uploaded instantly to CANON iMAGE GATEWAY# for easy sharing on social networking sites, and photos can even be printed on a wireless PictBridge-certified printer without the need for a PC. 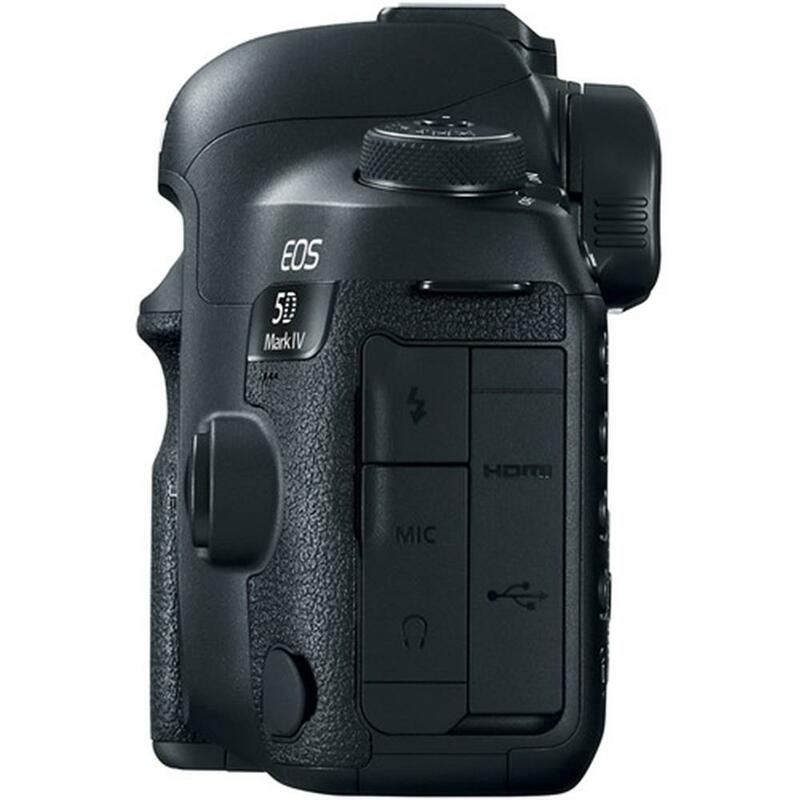 For more robust Wi-Fi connections, the EOS 5D Mark IV is also compatible with Canon's optional Wireless File Transmitter WFT-E7, which supports 2.4GHz/5GHz frequency bands, multiple camera sync and can extend the EOS 5D Mark IV's operating range up to 10 times that of the camera's built-in Wi-Fi. Compatible with iOS versions 8.0/8.1/8.2/8.3/8.4/9.0/9.1/9.2/9.3, Android smartphone and tablet versions 4.1/4.2/4.3/4.4/5.0/5.1/6.0. Data charges may apply with the download of the free Canon Camera Connect app. This app helps enable you to upload images to social media services. Please note that image files may contain personally identifiable information that may implicate privacy laws. Canon disclaims and has no responsibility for your use of such images. Canon does not obtain, collect or use such images or any information included in such images through this app. Built-in NFC (Near Field Communication) technology helps provide the EOS 5D Mark IV camera with a virtually seamless connection to compatible Android devices. Simply tap to connect and transfer images and videos. 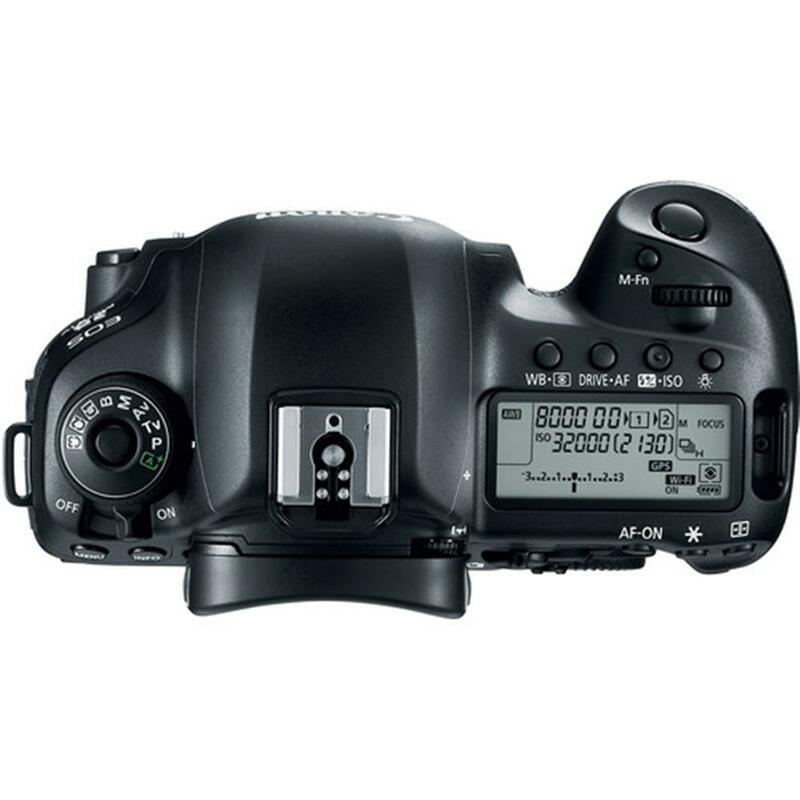 It's also compatible with the Canon Connect Station CS100 device, which makes it simple for photographers and moviemakers to view and organize all their photos and videos from one connected device. Compatible with Android smartphone and tablet versions 4.0/4.1/4.2/4.3/4.4/5.0/5.1/6.0. For news photographers capturing hundreds or even thousands of images while moving around throughout the day, landscape photographers on location and even photographers on vacation, GPS has become an indispensable part of a daily workflow. The EOS 5D Mark IV camera's built-in GPS helps photographers and filmmakers both tag their images with critical location data, and also adjust the time and timestamp on the camera automatically. Featuring both built-in GPS and Wi-Fi technology, the EOS 5D Mark IV can use GPS and WFT (Wireless File Transfer) together, making it easy to upload numerous images and movies both quickly and from increasingly distant locales. Compatible with American GPS satellites, Russian GLONASS satellites and Japanese quasi-zenith satellites Michibiki, the EOS 5D Mark IV's GPS information stays reliably accurate in many locations. In certain countries and regions, the use of GPS may be restricted. Therefore be sure to use GPS in accordance with the laws and regulations of your country or region. Be particularly careful when traveling outside your home country. As a signal is received from GPS satellites, take sufficient measures when using in locations where the use of electronics is regulated. The durable EF 24-70mm f/4L IS USM is sealed for excellent dust and water resistance plus has fluorine coating on the front and rear elements reducing smears and fingerprints Compact and lightweight, it's the perfect L-series lens for photographers on the go. Auto (Ambience priority/White priority), Daylight, Shade, Cloudy*, Tungsten Light, White Fluorescent Light, Flash, Custom (Custom WB), Colour Temperature * Effective also in twilight and sunset. 150.7 x 116.4 x 75.9mm / 5.93 x 4.58 x 2.99 in.